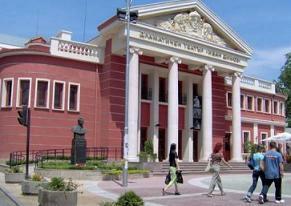 Haskovo is a town with rich cultural inheritance and significant achievements in science and art. For three decades already in April debutants in the poetry and prose from all the country have met, attracted by the traditional literature days “Southern Spring”. In May the famous park Kenana near Haskovo turns into a scene of another traditional local show – the local art fair “Kitna Trakya (Colorful Thracia) singing and dancing”. Amateur groups from all the folk areas of Bulgaria compete in singing and dancing. The music days, called after the prominent Haskovo violinist Nedyalka Simenova, have attracted young musicians of classical music for many years now. The competition for instrumental players at the end of October is accompanied with many performances of the local Symphony Orchestra and famous guest musicians and formations. Haskovo is a hospitable town to the Republican Championship in Sports Dances, the traditional Week of the Community and Library Centers, starting on 1st November, the Christmas Folklore Festival, presenting authentic national customs and songs. The town has its own Historical Museum gathering the long century richness of the forefathers, a Club of the People of Culture, several art galleries, a Regional Library, many Community and Library Centres, various chorus, music and dance formations. Haskovo is proud of the founded in 1858 Zaria Library and Culture Centre and the Theater “Ivan Dimov”, named after one of the best Bulgarian actors, who had also worked in Haskovo. The 125 anniversary of the theater life in the town was celebrated on 8th September 2004 with the official opening of the fully renovated and reconstructed building of the theater. The President of the Republic of Bulgaria - Georgi Parvanov - was guest at the ceremony that took part on the day of Haskovo. The singers, dancers and instrumental players of Haskovo have won many awards and medals in the country and abroad. Their skills are part of the rich palette of cultural performances, organized by the Municipality every year for the day of Haskovo – 8th September.